Energy Impacts 2017 is the first North American conference focused on social science research related to the impacts of energy development - with a goal of synthesis, comparison and innovation among established and emerging energy impacts scholars from North America and abroad. The pace, scale and intensity of new energy development around the world demands credible and informed research about potential impacts to human communities that host energy developments. While a fast-growing body of research addresses social, economic, and behavioral impacts from large-scale energy development for host communities and landscapes, their discoveries are often isolated by disciplinary and geographic boundaries. We invite participation from sociologists, geographers, political scientists, public health specialists, economists, anthropologists, practitioners and other interested parties whose work addresses impacts of new energy development for host communities and landscapes. Call for papers coming soon! Please visit http://www.energyimpacts.org<http://www.energyimpacts.org/> to join a mailing list for future updates, and to add your profile to our growing data base of energy impacts researchers and professionals. If you are a researcher examining the social impacts of any energy development from any social science discipline -- including for example, economics, sociology,  public health, geography, and more -- please join us in our experiment to network your research with others through our Energy Research directory located at directory.energyimpacts.org<http://directory.energyimpacts.org/>. The researcher directory is intended to link and network researchers  across academic disciplines in the areas of energy research and social science. The directory is searchable by name, keyword, energy type, location, discipline and more. Creating a profile is quick, easy, and free, and you can divulge as little or as much contact and biographical information as you like. In addition to a summary statement about your work, an link to your faculty page, upload your CV, or upload papers. The directory is new, and your participation and feedback is welcome. 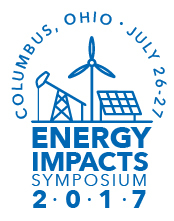 Please spread the word about the Energy Impacts Symposium and the Researcher Directory. Grant No. 1528422. Any opinions, findings, and conclusions or recommendations expressed in this material are those of the author(s) and do not necessarily reflect the views of the National Science Foundation.